Mercer School Principal Paula Sadgrove with Viky Narayan, CrestClean’s Auckland South Regional Manager. She was lost for words after a surprise win that has paved the way for her to attend the New Zealand Principals’ Federation conference in Wellington. 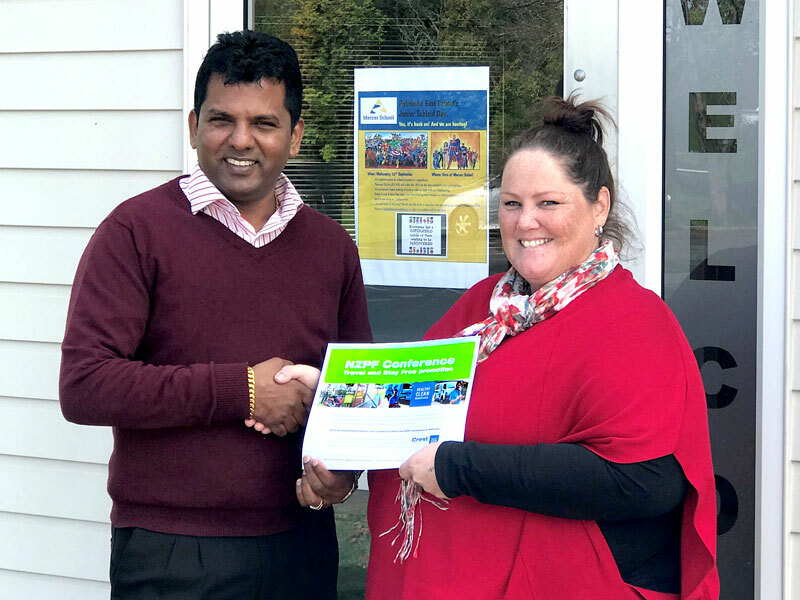 Paula Sadgrove, principal of Mercer School, had just about forgotten she’d entered a CrestClean promotion when the company’s Auckland South Regional Manager Viky Narayan turned up to personally deliver the news that she was the lucky winner. The $1000 prize will go towards covering Paula’s costs for the conference fees and airfares to the capital city. “I’m really appreciative as it’s my first year as a principal and to have something like this happen is just wonderful,” says Paula, who never thought she’d get the chance to attend the conference. Small schools like Mercer don’t have a budget to be able to cover the costs sending teachers to such events. Viky says he was delighted the prize has gone to someone who otherwise would not have been able to attend the conference. “Paula was speechless when I told her she was the winner. CrestClean has recently taken over the cleaning at Mercer School, and Paula says Viky had gone out of his way to help.